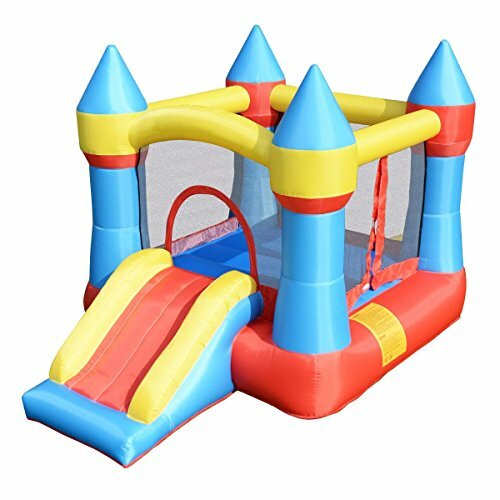 This inflatable castle designed with a slide is a bounce house that really enjoys a great popularity. It would be a paradise for your kids. It features a "safe slope" slide providing secure and easy access. The bouncy house is surrounded by a net with hook-and-loop fastener entrance which ensures kids safe when they bounce and have a blast! The fire-resistant bounce house is easy to blow up with a blower (not included in delivery). It is the bigger, improved version of the classic blast zone castle. The large magic castle is an ideal bounce house for backyards, indoors, sleepovers and more. What a great present for your little prince or princess to bouncing around.